Pickbay pendant + Color Therapy using the beautiful set of luminous gemstone colored guitar picks which are easily changed out for the new desired look! Heirloom quality pendant of stainless steel will never tarnish not fade. Embrace these colors for healing. 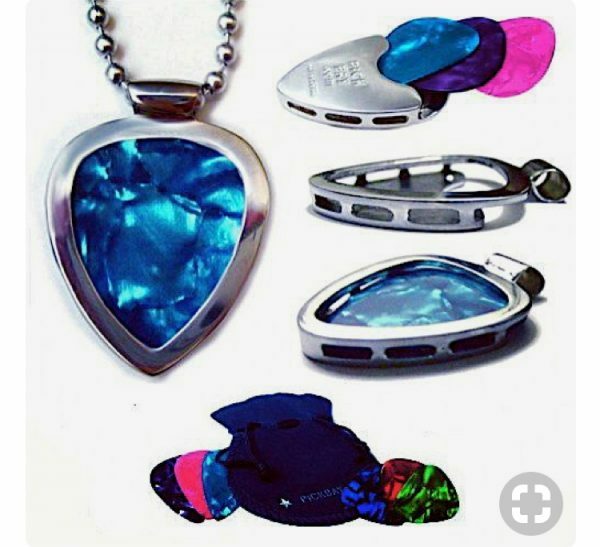 This set comes with 6 colored gemstone colored guitar picks. Do some chakra work with the color you need to embrace. Great way to wear your colors. 1,000 Necklaces in ONE! One PICKBAY pendants gives years of wearing pleasure! Pickbay will become your favorite necklace ever! This will be the favorite gift forever!! AUTHENTIC “PICKBAY” pendant. Best gift ever….read on…. “Expertly engineered” (quote from PICK COLLECTING QUARTERLY REVIEW) Pretty with the jeweltone pearloid picks, AND a functional musician accessory when you add the Fender, Gibson or Martin picks. You will receive ONE PickBay Stainless steel shiny Chrome pendant with the adjustable 24″ stainless steel 3.2mm bigger ball chain (Its the highest quality most durable hypoallergenic ball chain!!!) 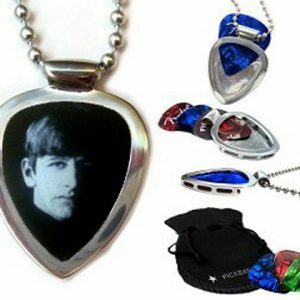 & 6+ jeweltone Guitar picks. Each PICKBAY is hand made, hand polished. Each PICKBAY is a work of art and has a “personality” of it’s own. made carefully for you to have and to wear for years years and years to come! You only need one PICKBAY for a lifetime of wearing pleasure! This auction is for the “Stainless Steel Chrome PICKBAY pendant” with 6+jeweltone pick set. Also fun to use to show off your authentic concert guitar picks inside. No limit to how cool his necklace set can be! This gift is for the guitar player, the music fan or someone who just enjoys a cool necklace. A gift for everyone & anyone. Truly unique. Change your look each time you change your guitar pick. Looks like a shimmering jewel when the pearloid picks are in, looks like a guitar accessory when you put in the official “fender” pick. Most unique gift item you will ever find. Stainless Steel PICKBAY PENDANT!!! FRESH FROM THE SUNSET STRIP IN HOLLYWOOD, CA…..PURE ROCK N ROLL IN THIS ITEM! THIS NECKLACE/PENDANT NEVER GOES OUT OF STYLE….BEST, HOTTEST GIFT & FASHION ITEM EVER, YET READY FOR THAT “GUITAR PICK EMERGENCY”……COOLEST NEW FASHION ACCESSORY FOR THE FASHIONISTA OR GUITAR PLAYER OR THE MUSIC BAND FAN! 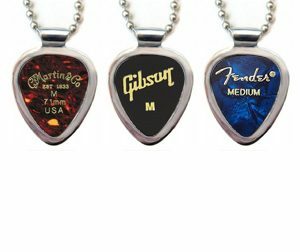 NEWLY PATENTED PRODUCT, PICKBAY tm….CHROME Stainless Steel GUITAR PICK HOLDER DISPLAY PENDANT. COMES WITH a 24” Super shiny 3.2mm bigger ball chain and a bag of pearloid PICKS! PLUS a polishing pouch to complete the gift set, INCLUDED WITH THIS PENDANT. The “PICKBAY” PENDANT FITS THIN, MEDIUM & heavy PICKS. It holds 1-3 guitar picks. This auction is for the Stainless Steel version! GREAT FOR the guitar player… for THE guitar pick “emergency” as well as the coolest “guitarist bling” thing, great for music fans too. Cool gift item…get yours for year round gifts now. FINALLY A COOL WAY TO DISPLAY YOUR COLLECTIBLE CONCERT BAND PICKS…INSTEAD OF THROWING those guitar picks IN A DRAWER. This Pickbay necklace set is the coolest fashion for your Sweetheart, an extraordinairy gift they will treasure forever! Pickbay is the BEST gift! We offer worldwide shipping!!! Great for gifts year round. Pickbay is 1,000 necklaces in one! Authentic original PICKBAY PLECTRUM HOLDER PENDANT and PICKS GIFT SET! Jeweltone pearloid picks, look like jewels. THis pendant can be 1,000 necklaces or more. Change your pick, change your look, change your life. Hand cast, hand polished Limited production. You just need one for a lifetime of wearing pleasure. To be clear, this pendant holds 1-3 guitar picks. 3 thin gauge, 1 medium and 1 thin, or 1 Heavy Or more. Gift set comes complete in a velvet polishing pouch, ready to give! PICKBAY PENDANT!!! PLECTRUM HOLDER and a COOL WAY TO DISPLAY YOUR PLECTRUMS! Reeks of Rock N Roll cool! FRESH FROM THE SUNSET STRIP IN HOLLYWOOD, CA…..PURE ROCK N ROLL IN THIS ITEM! 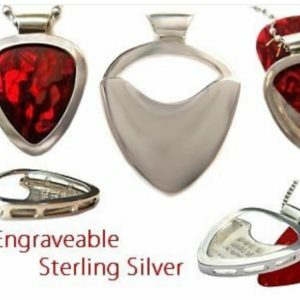 THIS NECKLACE/PENDANT NEVER GOES OUT OF STYLE….BEST, HOTTEST GIFT and FASHION ITEM EVER, YET READY FOR THAT “GUITAR PICK EMERGENCY”. The “PICKBAY” PENDANT FITS THIN, MEDIUM and Heavy 351 style guitar PICKS. It holds 1-3 guitar picks, depending on gauge of the pick. Use your PICKBAY pendant with 2 picks at once. GREAT FOR the guitar player…OR for THE guitar pick “emergency” as well as the coolest “guitarist bling” thing, great for music fans too. Cool gift item…get yours now. THE PICKS SLIDE IN AND ARE KEPT IN PLACE BY THE UNIQUE DESIGN. THIS ONE TIME INVESTMENT WILL LAST FOR YEARS, AND IS ONE OF THE MOST VERSATILE ACCESSORIES YOU WILL EVER OWN! FINALLY A COOL WAY TO DISPLAY YOUR COLLECTIBLE PICKS…INSTEAD OF THROWING those guitar picks IN A DRAWER. Ships from the original designer/manufacturer in Los Angeles. WE ARE HAPPY TO SHIP TO WORLDWIDE DESTINATIONS. contact me with any questions.